Pro-actively divert rainfall away from the drainfield. Plan all landscaping drainage and rooftop gutters to feed excess water away from the drainfield. A soggy, saturated drainfield will not work effectively. Do not plant grass over your drainfield and discourage root damage by keeping trees at least 100 feet away from the septic system (even farther if they are an aggressive arbor strain like willows. Be careful not to overload the system. Regularly check faucets and toilets for leaks and reduce water consumption whenever possible. Small changes, like waiting for the dish washer to be full before running it and placing a displacer in the toilet tank will help your system. Do not pour grease or cooking oil down the drain as these thick liquids will clog the drainfield. It goes without saying, but do not pour toxic materials (like paint thinner or car oil) down your drain either. Besides clogging the drainfield, they will poison the groundwater. Do not treat your toilet like a garbage disposal. Never flush non unnecessary solids, like paper towels, sanitary products or even cat litter. All of these things will clog the system. Same goes for your garbage disposal. Limit what you put down the drain and install a high quality garbage disposal that completely purees the waste that you must wash down the drain. Promote a healthy drainfield environment by limiting the use of chemical cleaning agents, detergents and soaps. Chemical household cleaners wash down the drain and concentrate in the septic system, often killing the beneficial bacteria required to effectively break down biological waste. These creatures are the lifeblood of a healthy septic tank system, so when possible, use non-chemical cleaners such as Dr Higa’s EM-1 Microbial Innoculant in the place of chemical cleaners and detergents. Regularly re-introduce beneficial bacteria into your septic system with a product like EM-1 Septic Tank Microbes for maximum drainfield health and performance. 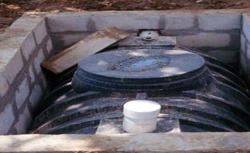 Have a professional pump your septic tank every 3 to 5 years.